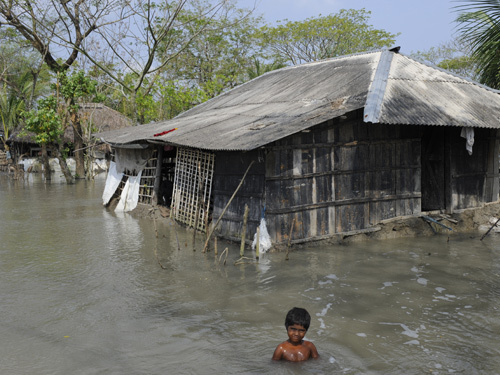 Ten-year-old Moyna took a bath outside her flooded home in Bangladesh’s low-lying Ganges River Delta. The Delta is regularly flooded as cyclones create storm surges atop the rising sea. Both effects, linked to global warming, endanger millions. The dirty and destructivefloodwaters carry disease. The effect of the rising sea is multiplied because the soil in this homeland to dozens of millions is compressing, oxidizing and subsiding. Michael Mann, professor of meteorology at Penn State, dropped by Madison, Wis. last week, and we quizzed him about the state of the climate. Mann’s post-doctoral work1 thesis introduced the “hockey stick,” a graph showing the accelerated pace of warming, based on records of temperature over previous centuries. Mann’s provocative graph became a core of the effort by former vice-president Al Gore to raise the alarm over global warming. It also became, among global warming deniers, a target of attack. Mann was caught up in the manufactured crisis called “Climategate,” and scourged by some media, leading to a flurry of legal actions from both sides. Michael Mann’s graph from 1999 showed that a rapid rise in global temperatures started around 1990. Other computer models have found much the same thing, and now the record from instruments (red) tracks those modeling trends. Shaded areas show uncertainty range for some studies. 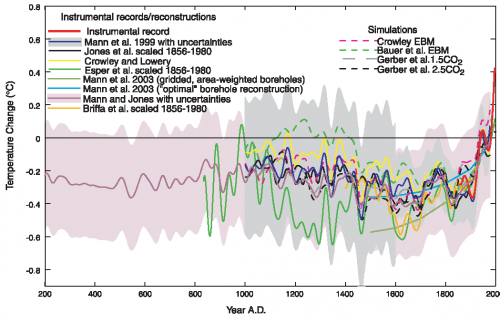 The Why Files: Is the hockey stick still accurate? Michael Mann: The most recent IPCC report based on many different groups using different approaches and data, has come to an even stronger conclusion. The recent warming is unprecedented over the last thousand years, and potentially tens of thousands of years. [IPCC reported that “The globally averaged combined land and ocean surface temperature data … show a warming of 0.85°C, over the period 1880 to 2012…”]. But the hockey stick is almost a sideshow; it’s one line of evidence that the warming probably has to do with what we are doing with greenhouse gases. There are dozens of independent lines of evidence for the reality of human-caused climate change. The focus on my study … pretends that one 15 year-old study by one post-doc provides the entire weight of evidence for human caused climate change. It’s a straw-man argument that has been used in a very cynical way, to make it seem like our entire understanding of climate change rests on a house of cards; if you pull out the hockey stick, it collapses. Even if the stick did not exist, even if no paleoclimate data existed, we’d know that human-caused climate change is real, that greenhouse-gas releases pose a threat. The growth in releases of carbon dioxide, the primary greenhouse gas, has doubled in the last decade, compared to the rate before 2000. China saw the biggest increase, but these gases fell in the United States and Europe. Total greenhouse-gas pollution was 54 percent higher in 2100 compared to 1990. Average annual CO2 emissions from fossil fuel combustion and cement production contained 8.3 billion tons of carbon per year between 2002 and 2011. TWF: How are we doing in alternative energy? MM: The U.S. always prided ourselves as leaders in the global marketplace of ideas and innovation, but we are behind the rest of the world. 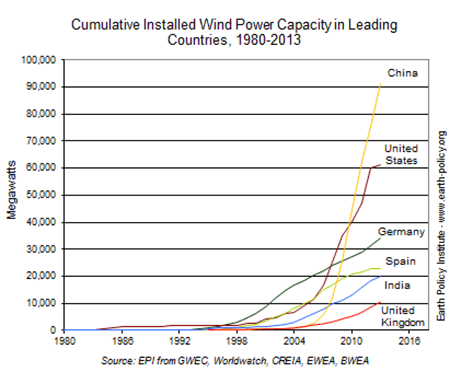 China and India are pulling ahead in the amount they invest in clean energy. We have a legacy of two centuries of access to cheap, dirty energy. Ironically, it’s the developing world, which does not have that legacy, that seems to be moving to embrace renewable energy, wind, solar and geothermal. In a few countries, like the U.S., entrenched special interests don’t want us to transition away from a reliance on fossil fuels. Despite all the emphasis given to alternative energy, fossil fuels are the preponderant energy source, followed by hydroelectricity, nuclear and wind. TWF: What should be the role of nuclear power in a low-carbon future? MM: That could be an interesting discussion. 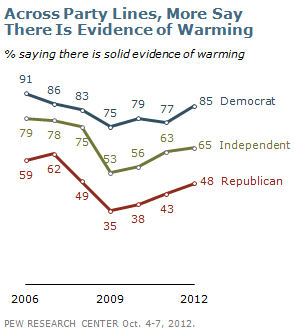 Let’s have that discussion in Congress, rather than debating the existence of climate change. What policy and energy alternatives should we use to deal with the climate change problem? We need to hear conservative and progressive voices about the role that nuclear and natural gas should play. TWF: On climate, are local and regional changes still the biggest area of uncertainty? MM: That’s where the rubber hits the road. We don’t feel the global average temperature, (except along the coast, where you see its effect on rising sea), we feel the local weather. Climate change might impact what we are already feeling. We’re seeing an increase in extreme weather, widespread drought, record heat. To inform the debate over mitigation or adaptation, we want to know what is coming down the road, to support resilience to climate change we are already committed to. There is uncertainty in model projections, but uncertainty is not our friend. It’s used as an argument for inaction, but there may be surprises or tipping points, things we have not found with the models, because they are approximations of reality and the impact may be worse than they say. Nuclear generation output has fallen to 1997-’89 levels, amid cutbacks in nuclear-heavy Europe and Japan after the 2011 Fukushima meltdown. Nuclear is a low-carbon electricity source, because fossil fuel is used to mine, process and transport ore. Nuclear has traditionally been opposed by environmentalists, who decry the health effects of mining uranium, and the difficulty of safely storing high-level radioactive waste, but it has been getting a second look as the climate continues to warm. TWF: With climate such a political issue, are climate scientists obligated to be more public about their work? Dead and dying cattle in northern Kenya during a drought. Africa’s climate has always been erratic, but global warming seems to be increasing droughts, floods and other extreme weather. MM: When I found myself at the center of attack [during the “Climategate” controversy], I had to make a choice. Would I respond and defend my science, or retreat to my lab? I chose to fight back … moving from a naïve young scientist who found himself at the center of much larger forces that he was not trained to deal with, with attacks by politicians and bad-faith criticism. That’s not the way science works. Real skepticism is the way science works. I think more young scientists are becoming engaged and realizing that science outreach is critical. I cannot think of anything more important than trying to inform this discussion about the greatest challenge that human civilization has dealt with. 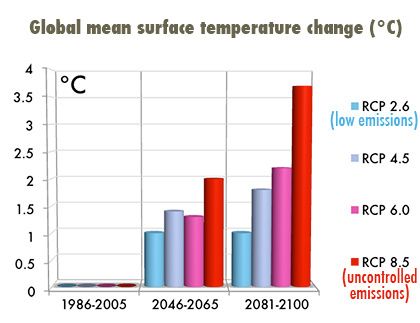 The IPCC (Intergovernmental Panel on Climate Change) projected temperatures at various levels of greenhouse gas pollution. (RCP, or representative concentration pathways, is used to anticipate possible levels of greenhouse gases pollution. RCP2.6 is a low-emissions scenario, while RCP8.5 accounts for unabated emissions.) Roll over graph to see scenarios for sea level rise. TWF: What do you make of the seesaw in public opinion about climate warming — sometimes accepting the reality of change, sometimes denying it? MM: We have delayed confronting the climate problem because the fossil-fuel industry has funded disinformation for several decades. We knew tobacco-industry products were killing people in the 1950s, but it wasn’t until many decades later that we really acted on policy. The tobacco industry, rather than engaging in a good faith discussion about what to do about the problem, chose to hide the health impacts, to discredit the science. It’s the same playbook with fossil fuels. Delay has costs. In the case of tobacco, we acted decades late, and there were potentially millions of lives lost. Here, we are talking about the health of the entire planet; there is no “planet B” if we screw this one up. But I have no doubt that we will act in time to avert truly catastrophe climate change. I’m an optimist, and I recognize that some conservatives are coming out and embracing the existence of the problem, not trying to deny it. TWF: Where do you expect average global temperature to be in 50 years? MM: The precise amount of warming for a given increase in greenhouse gases is uncertain, but the dominant uncertainty is what we choose to do. The toughest thing to do is to predict what our fellow human beings will do, but I hope that we will not leave this problem behind for our children to try to solve. We can still avert 2°C warming, we can stabilize below that. The real danger zone may come in terms of food, water, health or national security. We still have time to avoid crossing that threshold, but to do that, we have to act in the next few years. We hold the future in our hands. 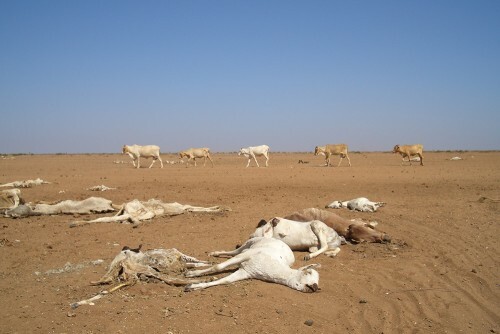 Drought + food = instability? Climate change: Who is a climate scientist? As snow goes, where go the animals?